Travelers' use of personal electronic devices rose sharply with city-to-city travel experiencing the fastest increase, according to a study by DePaul University. 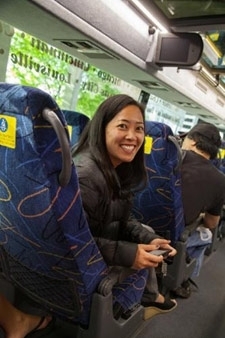 The ability to use devices throughout trips continues to stimulate demand for bus and train travel. Technology use on airlines remained virtually flat and continues to lag behind other modes, according do the study, from the Chaddick Institute for Metropolitan Development. "As opposed to airline customers who cannot surf the Internet, email, text or place phone calls during takeoff or landing, which can consume more than 40 minutes of flight time, customers traveling by an express bus service like Megabus are able to use their devices from the moment the bus arrives to the time they depart at their destination," said Joseph Schwieterman, director of the Chaddick Institute and co-author of the study, in a release. "Travelers want to stay in control and that means staying digitally connected when and where they want." The study, which is the fifth in an annual series by the Institute, collected data from 7,034 passengers on 106 bus, train and plane departures during February-June 2014 and made comparisons with a similar sample from 2013. The study found that the use of personal devices among passengers remains on an upward trajectory. Nearly 90 percent of passengers use electronic devices at some point during their trips. "As travelers feel an ever-rising need to stay connected, technology advances appear poised to continue to transform the way Americans move from place to place," Schwieterman says. "The rising use of personal technology will continue to change the way we travel."